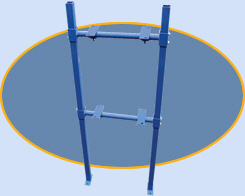 Conveyor Stands - Roll-A-Way Conveyors Inc. Formed 12 gauge channel legs with adjustable plates for incline or decline. Prepunched feet for permanent installation. 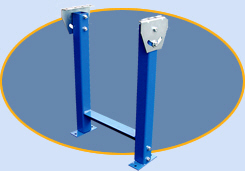 2” square tubing legs with adjustable plates for incline or decline. Prepunched feet for permanent installation. 4” structural steel upright. 1” adjustable increments. Portable, durable, 3-legged support. 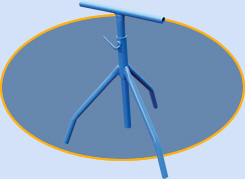 Ideal for temporary installations. 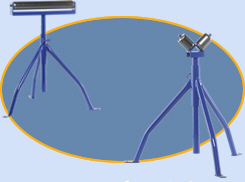 These supports are easily transportable with four double ball bearing swivel casters. Standard with wheel brakes. Can be moved anywhere in your plant. Heights can also be adjusted. 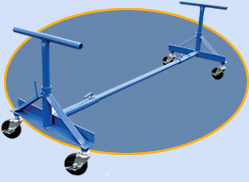 Can be used with skate wheel or light duty conveyors. 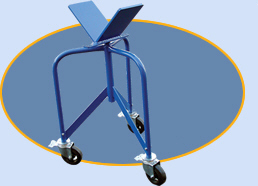 V-stand with 6” swivel casters with brakes holds up to 16” pipe. 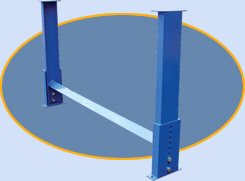 Tier stand provides support for multi-level installation of conveyor lines. Two tiers standard with extra tiers available for special applications. 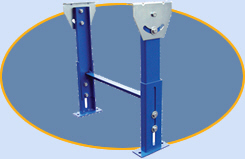 Consult factory for super heavy duty tier stands. applications. Highly portable. Can be used anywhere within a plant or warehouse. Strong and durable.